Each of these Infographic Templates (except for true Infographics Bundle) is represented in .PPT, .PPTX, .KEY, .PSD, .EPS, .AI and .JPG files. I`m new in all design related things and i´m opening a small business. If I’m not a designer and I don’t need have any additional programs or software like illustrator or photoshop, are these graphics something I can still use and edit? And I was wondering if this product includes all the little figures. Another question, this will be my first purchase of a design product and I have no idea how this works or if I can use it in another computer or how will it work. thank you so much for this wonderful product!! Thanks so much for commenting and it is great to hear that you are starting out with design- this is so exciting! We always list the software compatibility of all of our resources on the deal page, so you can definitely double check to see if these should work for you before you buy! This particular infographics pack has been created for Photoshop Illustrator, Keynote and Powerpoint so if you have either of these programs installed on your computer, you should certainly be able to work with them Esther :). I have just sent an email over to you to give your further information on how your downloads work and I hope that you have great fun finding some awesome additions to your design resource collection. A friend shared this with me as they thought I may like to use some of the graphics. I’m a small biz owner and share info/create ‘some’ documents and slides. If I’m NOT design savvy and I don’t need have any additional programs or software are these graphics something I can still use and edit the colors to match my brand as well? 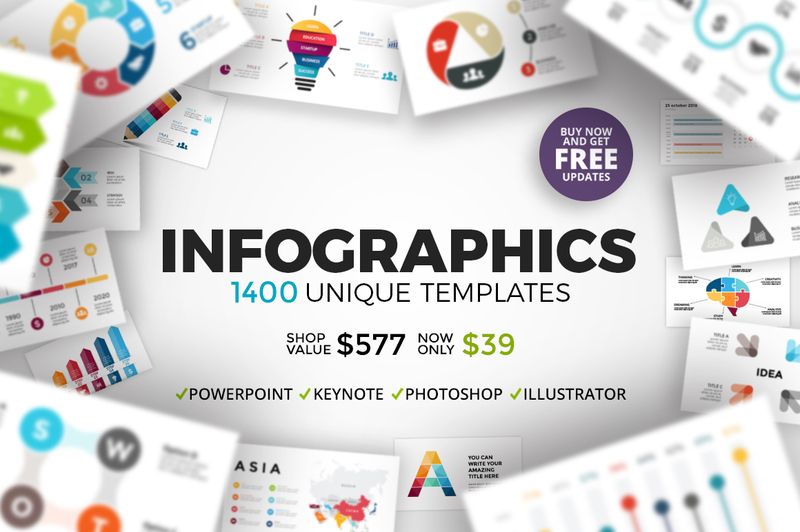 It’s great to hear that you are interested in our 1400 Infographic Templates, the great news is that the designer has advised that “Each of these Infographic Templates (except for true Infographics Bundle) is represented in .PPT, .PPTX, .KEY, .PSD, .EPS, .AI and .JPG files.” This means that you should be able to work with these in a variety of software, including Keynote, Powerpoint, Illustrator and Photoshop. I have just popped you over an email as well so please feel free to let me know what software you are working in so that I can help you further with this! Hey, great product! How do I use the paintbrush textures as clipping masks from the Bonus Slides folder? Can’t get them to work in InDesign or Illustrator. I am so sorry to hear that you are experiencing difficulty with your Bonus Slides. I’ve got the same “Free-updates-4-ever-Problem” like Andy! I think, I’ve bought two or three versions of your fantastic Infographic Super-Trouper-Bundle on several platforms, only to get the newest Version. How can I get informed about New Updates – an can get them? I’m so sorry for any confusion caused by this one rest assured I have popped you over an email to help! First of all! This is a ludacris product and I can’t believe the amount of work that lies behind! You guys must have been up all night-and-day for this one. KUDOS! An optimistic thank you in advance, and well done making this product! Yay we’re so glad to hear that you love it and thank you so much for your super kind words!